Do you dare head offshore with just one engine? Too bad modern diesels aren’t as dependable as those old GMs. 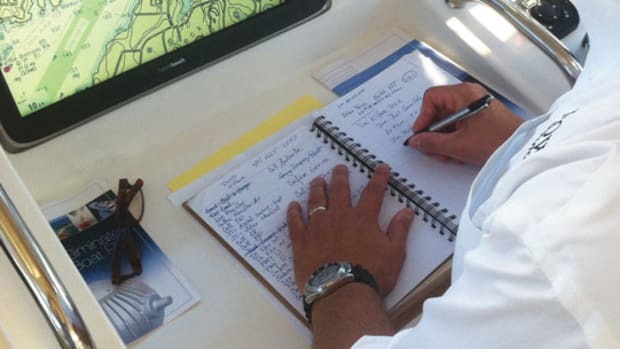 But then, actually, most of them are, although apparently not all bluewater-voyaging powerboaters think so: Many skippers contemplating an offshore passage in a single-engine boat want redundancy, some kind of emergency power in case the main engine decides to take time off. 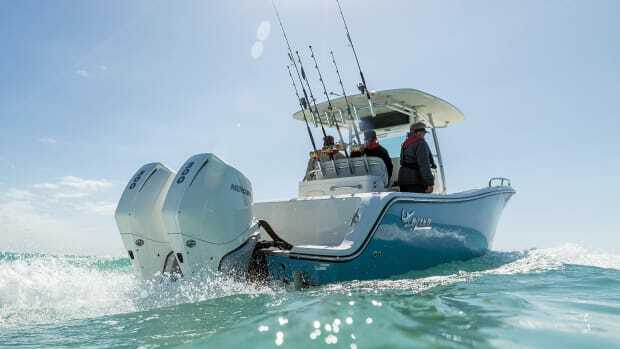 Until now, folks have called this “get-home power,” but it’s really “get-somewhere power,” since that’s what it does: propel the crippled vessel at reduced speed to the nearest port with a boatyard, a mechanic and a healthy supply of spare parts. A wing engine can have hydraulics that power thrusters, pumps and other equipment. I have no argument with redundancy, but what’s the best way to get it? 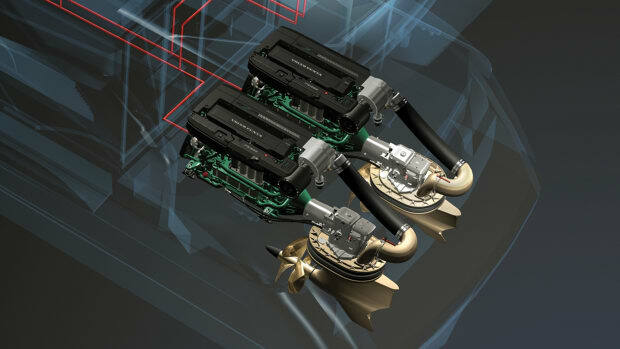 When it comes to back-up power, adding a wing engine is the go-to answer for many folks. Wing engines—some folks call them pony engines—are much smaller than the main engine, but with enough power to push the boat at 4 or 5 knots in normal sea conditions. They have their own electrical systems, pull fuel from a dedicated tank and spin a separate shaft and propeller, which can come in handy should the main running gear, despite being well-protected by the keel, come out on the short end of a collision. The downside is, a wing system means another engine to take up space in the ER, more maintenance and another supply of spare parts to carry. To keep it reliable, the wing engine—any engine, really—should be exercised regularly, even when not voyaging. I’d say run it once a week, at least long enough to reach operating temperature. And put it in gear: Most wing systems use feathering props to reduce drag and keep the shaft from spinning when the engine’s shut down, which can overheat the transmission. If a feathering prop isn’t used regularly, when you need the darn thing it may just refuse to un-feather. 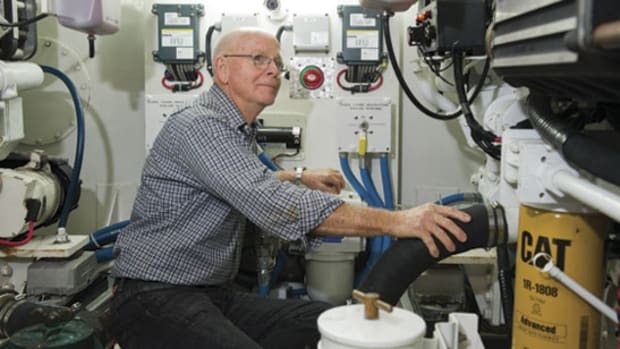 Most people fall short on exercising their engines, so, as naval architect Charles Neville told me, “A pony engine sits there, never being used, and then when you need it, it won’t start.” And, he added, if the three-inch main shaft is wiped out, chances are the puny pony-engine shaft will be, too. 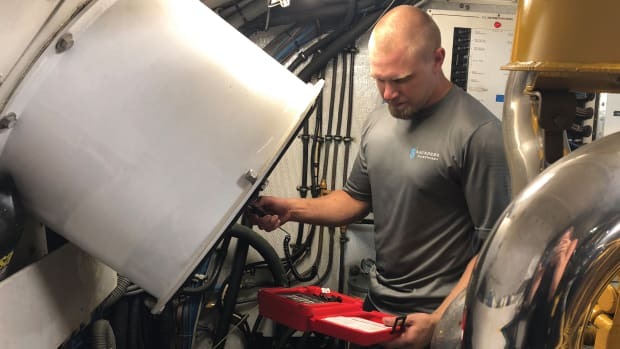 Neville, who says he has no strong preference for a particular back-up system—and hasn’t had any recent requests for any, either—has in the past used a genset-powered hydraulic motor attached to the main prop shaft. It doesn’t require maintenance like a pony engine does, he said, and doesn’t need old-fashioned belts or other means to connect to the shaft. It’s easy to activate, so you can exercise it when you’re not broken down, and there’s no added drag from a wing engine’s running gear. 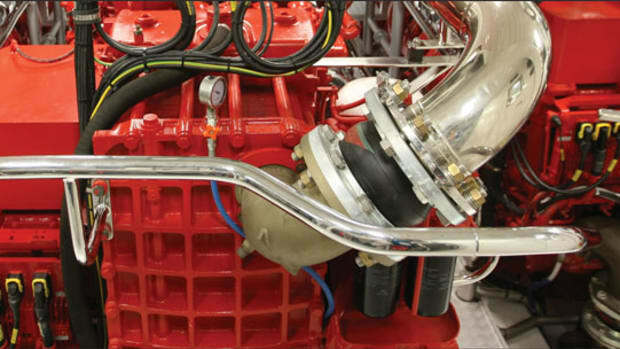 Wesmar’s APU 300 auxiliary propulsion unit fits around the inboard end of the main propshaft, spinning it by means of a hydraulic motor driving cog belts inside a housing. The APU 300 engages with just the turn of a key and the flip of a switch at the helm; a joystick controls shift and throttle. According to Wesmar, some owners use the system for fishing and docking, in lieu of trolling valves. 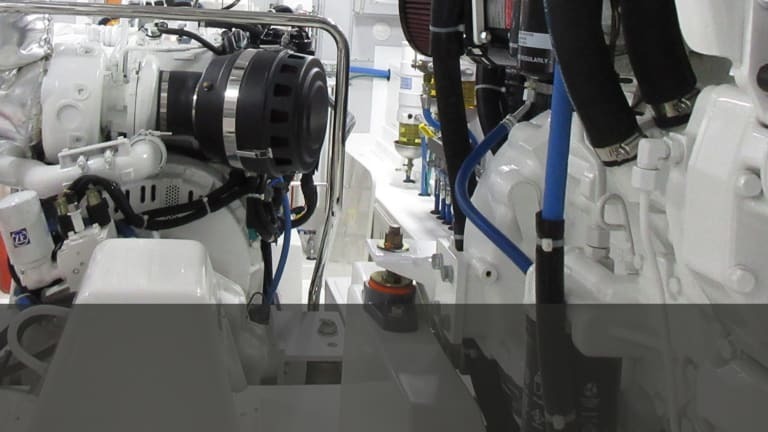 The APU’s hydraulic motor can be powered by a genset from 16- to 75-kW. 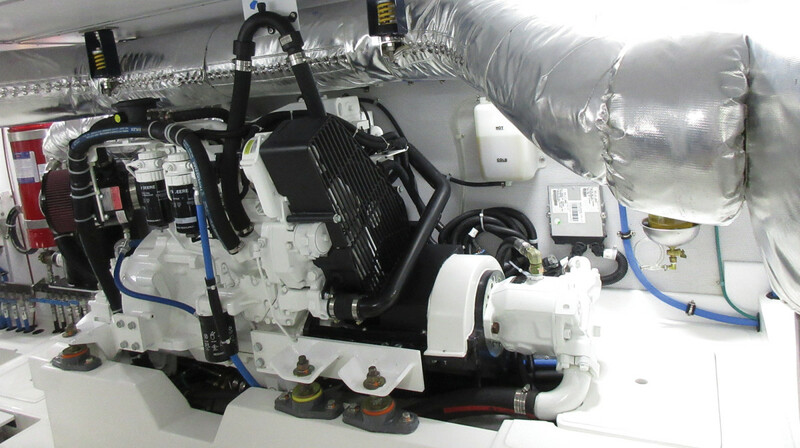 Even a 16-kW model is more genset than most yachts under 50 feet or so need; on the other hand, powering the APU with the genset means not adding a separate wing engine. Using the main shaft for propulsion rather than a wing engine offset to one side makes for better steering, too. While I, and other old-timers, extol the almost supernatural qualities of classic engines (“They don’t make ‘em like that anymore”) and, by inference, suggest modern engines are somewhat lacking, the truth is, today’s diesels are extremely reliable. A modern engine from John Deere, Cat or Cummins that’s chosen to match the needs of a given vessel; that develops its horsepower at relatively low rpm; that isn’t abused with unreasonable throttle, bad fuel or insufficient cooling; and that is scrupulously maintained, will equal—or outlive—those old motors we love in memory. My trusty GM 6-71 had more hours than anyone knew; she’d been running day in, day out for years when I came aboard. I added about 2,000 more hours, and she was still purring like a kitten when I left. Maybe she still is. She certainly had enough hours to have circumnavigate the globe several times over and wouldn’t have needed get-somewhere power to finish the voyage. Maybe you don’t need one, either, not if you follow the advice of some of the experts. A get-somewhere engine, according to Gerr, takes up space, costs money, adds weight and needs maintenance. If you don’t use it, the thing probably won’t work when you need it. 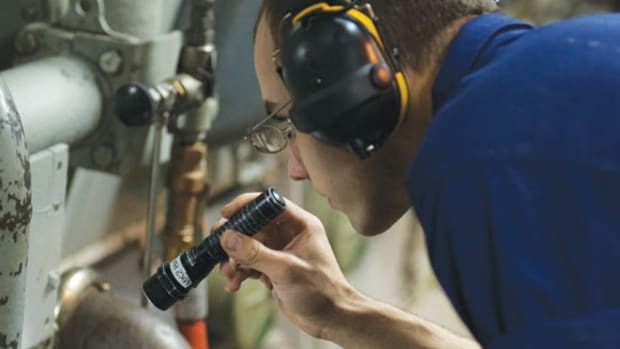 While get-home power may give you a feeling of security, it’s better to install a super-reliable single diesel, learn how to repair it and carry a full supply of spare parts. So far, Gerr said, none of his boats has needed outside assistance to reach port. “It’s hard to kill a well-maintained diesel engine that’s used regularly,” he added. I wish the same was true about boating writers. And if you can’t find a 6-71 when I cast off from this planet, you can bury me with a Lugger instead. It’ll get me there. If the main engine craps out and you need to fire up the wing engine, or if you’re running on just half of a twin-engine package, or if you’re sailing, don’t forget to lock the propeller shaft. Let it freewheel and, without the engine running to provide cooling, the gearbox could overheat. This can damage the seals and potentially other components as well. It depends on the gearbox: Some are okay with freewheeling, others are not, or can freewheel only for short periods at low speed—not the case if you’re heading for port hundreds of miles away. Check your gearbox manual. And remember: even if your gearbox can handle long-term freewheeling, it’s still better to lock the shaft. A spinning prop creates more drag than one that’s locked (although some experts disagree), and when running under get-somewhere power, drag is an issue. Freewheeling also puts unnecessary wear on the gearbox. The ideal is to lock the shaft with the prop tucked as much behind the skeg or keel as possible. For example, with a four-blade prop, two blades will lie vertically, and the other two will stick out at right angles. Mark the shaft when the boat’s hauled to show where to lock the prop. It can’t always be done, but it’s worth a try. Shaft locks can be as simple as a steel pin dropped through a bracket into a fitting on the shaft—you need to stop the freewheeling shaft first, which isn’t always easy with a big prop on the business end—to hydraulic disc-brake-type setups that work with the push of a button at the helm. I once gripped the prop shaft with a large pipe wrench and wedged it against a stringer—not ideal, but it worked. Your mechanic will doubtless have some better ideas. Bear in mind that if you’re powering your main shaft with a hydraulic motor in a get-somewhere system, there’s typically no cooling for the gearbox, but you can’t lock the shaft, since it’s turning. 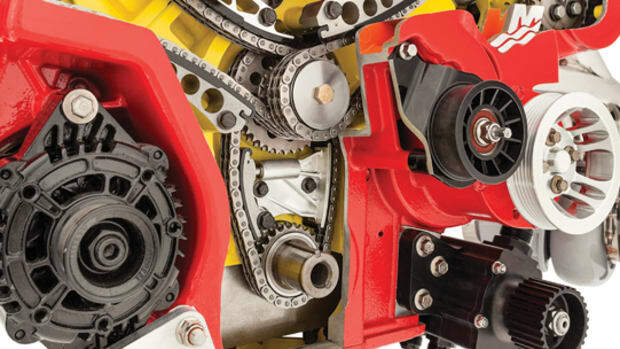 Choose your gearbox with this in mind and consult with an engineer prior to installation. Of course, if you keep your main engine running, you won’t have to deal with a freewheeling shaft. That’s the best solution.